The project A2 will transfer the achievements of the last funding periods to another catalytic reaction. The objectives are focussed on the reductive amination of 1-undecanal with diethylamine to long-chain amines. This reaction consists of two steps, a condensation reaction followed by a hydrogenation, i.e. a more complex reaction network compared to the earlier studied hydroformylation of long chain olefins (see figure 1). Figure 1: Reaction network of the reductive amination of 1-undecanal with diethylamine. Kinetic and mechanistic studies of the reductive amination are done in cooperation with subproject A3. The influence of diethylamine on the phase behaviour of the multiphase system is investigated in order to select a suitable surfactant for the reductive amination. Thus, the impact of the product concentration on reaction performance and phase behaviour is tested. Together with subproject D2 we aim for the development of a continuous mini-plant process in a minimum of time. Finally, the well-known hydroformylation and the reductive amination will be combined to the hydroaminomethylation reaction. There are different options for this combination, e.g. 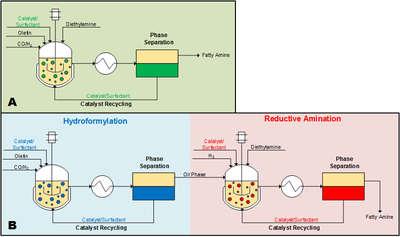 a one-pot synthesis with one catalyst and the same multiphase system for both reactions or a process with two consecutive reactions using different catalysts, surfactants and/or reaction conditions (see figure 2). Figure 2: Process scheme for the Hydroaminomethylation. A one-pot synthesis. B uncoupled consecutive reactions. Hamerla, T. Hydroformylierung langkettiger Olefine mit zweizähnigen Rhodium-Komplexen in mizellaren Lösungen und Mikroemulsionen. Technische Universität Berlin, 2014.